Stretched canvas is no longer the new kid on the block. It's now the 'must have' alternative to framing photos. And it's no longer a luxury item. It's an affordable part of every family's budget. Once only available to professional photographers for displaying their gallery works, stretched canvas - the process of wrapping canvas across and around a frame - is now mainstream. Today, you don't even have to go into a shop. Using our nifty Canvas App, you can now create a custom canvas online from the comfort of your own home. But why is it so popular? Let's break it down. The appeal of stretched canvas is its five-star finish. The appeal of Canvas Factory's stretched canvas is our world-class production process. The finest of memories deserve the finest of treatment and displaying photos on canvas truly honours those memories. Stretched canvas is such a quality product that it's hard to think it's something we can all afford. 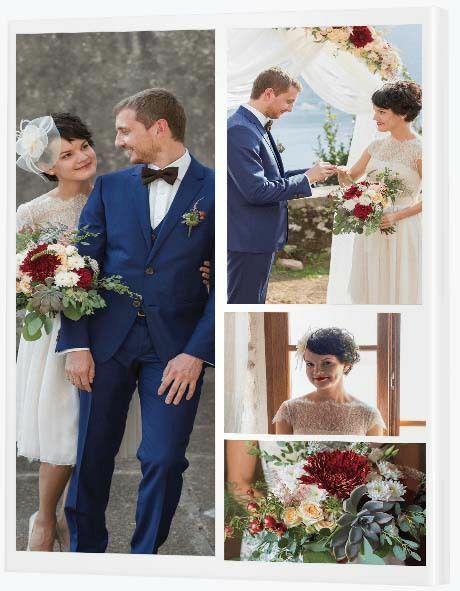 But both the cost and the results are remarkable, making it the ideal way to honour major milestones like weddings, births and deaths as well as the everyday things we enjoy like our pets, hobbies and travels. We spend so much money on our wedding day. We look the best that we can be, we arrange an event with beautifully styled decorations and we hire a professional photographer to capture it all. Then, for some reason, we simply settle for a photo album - an album that eventually gets tucked away in a safe place and only brought out on special occasions. When you mount your wedding photos on canvas and display them in your home, every day is a special occasion. You celebrate that love 365 days a year. When it comes to milestones, welcoming a new baby into your hearts and homes is one of the biggest. A baby changes everything. You are no longer two. You are three. And what a mad three you are. But those crazy days of nurturing a newborn are gone before you know it, so displaying baby photos on canvas is a way to treasure those memories for years to come. Besides, it's those little moments that help us get through the tough times. Every smile makes up for lack of sleep. Every small breakthrough - breastfeeding, rolling over, sitting up - makes up for even the smelliest of bottoms. You have used up the storage space on your camera and your phone over and over again. You've shared a gazillion photos on Facebook. It's time to take the next step and truly honour your little one. It's time to go canvas. While collages are a wonderful way to display a variety of your favourite photos, if there's a picture you love above all the others, a single canvas print can be the perfect solution. Once upon a time family portraits only featured people. Today, our furry friends can also appear front and centre. Our canvas printing is so affordable, all important family members can now enjoy the honour of a portrait. The unconditional love of our four legged friends is one of the greatest loves of all. 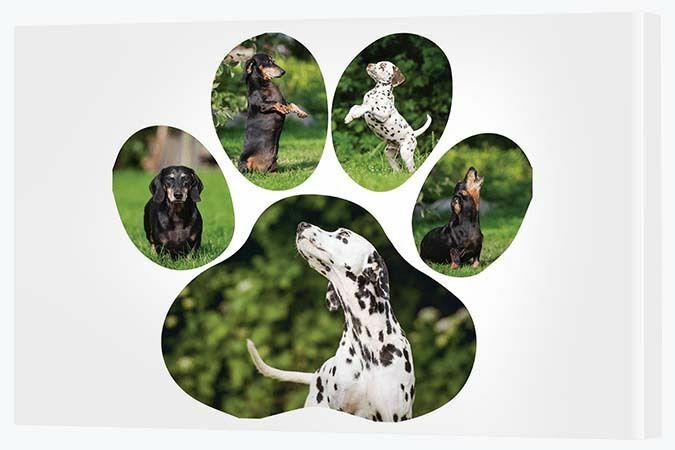 That's why we offer this purrfect paw print collage. Collect the cutest or the funniest cat or dog photos (or even both!) 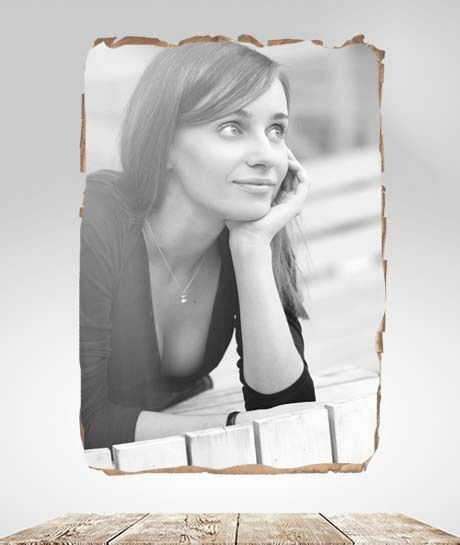 and create a customised canvas, a wonderful addition to your home or office. They may have left this world, but they will never leave our hearts. 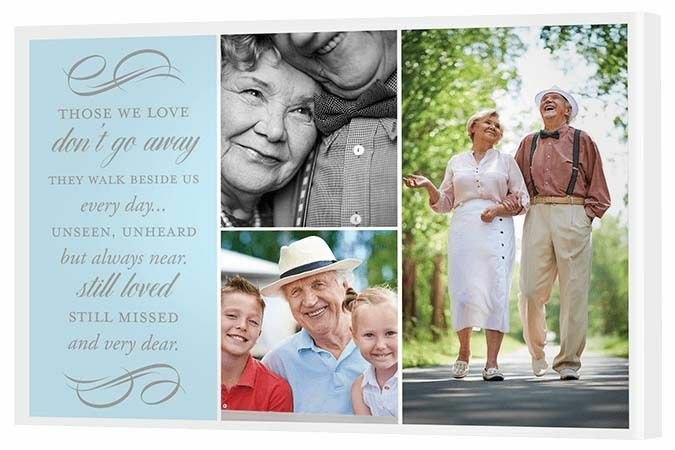 Treasure that love and those memories with a thoughtful canvas collage. A lifetime of love includes a lifetime of photos. The wonderful thing about canvas is it provides the opportunity to create customised pieces to suit any occasion. Unearthing photos - old and new - and transforming them onto canvas is a touching way to remember a life that may be gone but will never be forgotton. It's not about letting go. It's about holding tight. Canvas is no longer the sole province of fine photography only to be found hung in high art galleries. It's now gone global. There's nothing more satisfying than when the finer things in life become accessible to everyone. Once upon a time only a few of the world's elite had a mobile phone. Now pretty much everyone has one. Until recently, only a privileged few could enjoy gallery quality canvas prints. Today, we can hop online and order a canvas featuring our own personalised selection of photos. Sure, you can feature photographic art on your canvases if you wish, but you can also exhibit people you love and places you've been - all with the click of a mouse. 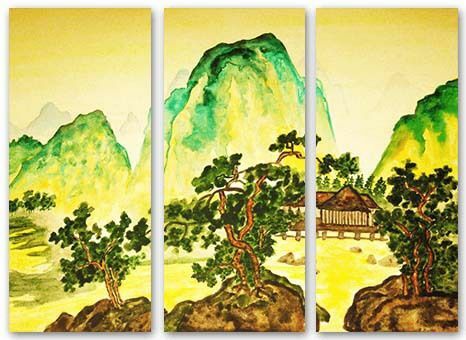 Get your creative juices flowing as you style your own canvas art to beautify your home. House proud? Love interior design? Have a creative streak? It's now possible to print your own or someone else's art to canvas. If you love following interior design trends, we have an online gallery of over 25 million images, many of them quality art - paintings, photography, mixed media. Whether you're a fan of modern, abstract, contemporary or ethnic art, you'll find something suitable in our collection to complement the style of your home and the colour palette of a room. When it comes to choosing what to display on canvas, the possibilities are endless. From fine art to funky craft, the only barrier is your imagination. Love inspiring quotes? Don't just print them out on a scrap piece of inkjet at work. 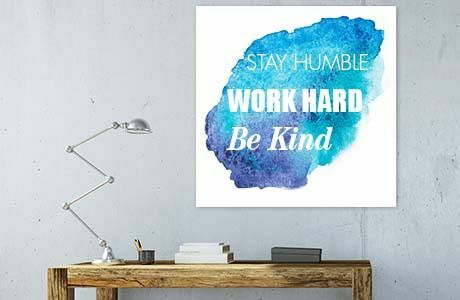 Inspire yourself each and everyday with your favourite quote mounted onto quality canvas. Whatever mantra you live by, you can either create your own inspiring quote using Canva or search 'quotes' in our online image library. Upload it to our Canvas App and you'll have a quality canvas delivered to your door before you know it. 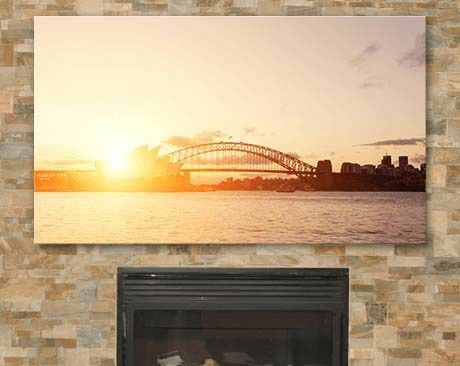 With canvas, you can say goodbye to ripped posters and hello to long-lasting visual appeal. There's no longer any need to endure the frustration of low quality giclee printers and posters. With stretched canvas, you can safely remove, move and transport your favourite prints without fear of them getting ripped and ruined. Just look at this example to the right. What was once no doubt a stunning monochrone poster has become worn and tired. We've all been there haven't we? Torn corners and blu tac stuck to the wall. It doesn't take long for a once special poster to get ruined. That's what makes canvas so attractive! Its visual appeal holds for years to come. Canvas, while you of course still need to look after it, is much more robust - it's sturdier to mount and remount, and easier to clean. Canvas prints deliver style and beauty to a home, with every room open to its charms. A living area can be transformed in no time. Take a moment to look around the room you'd like to enhance. What space is available to you? 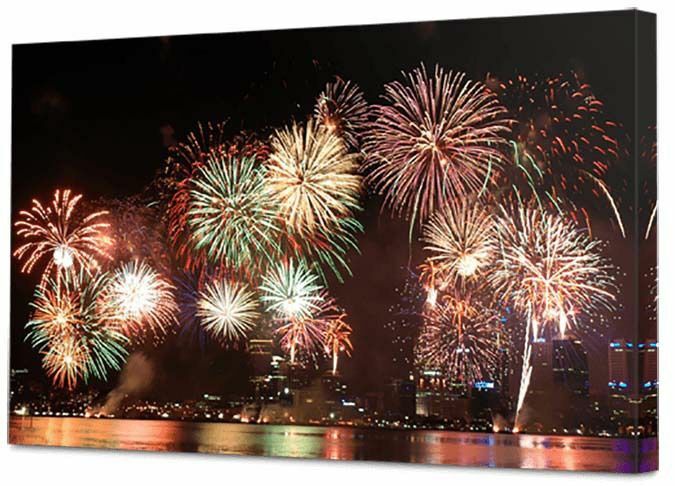 Canvas prints come in a seemingly endless variety of shapes, styles and sizes. You can design your own customised single print, split image print, wall display or collage. What colours are used in your decor? You can wrap your canvas in any colour you like. Our Canvas App has a colour picker, so you can cleverly match your wrapped canvas to your décor. The creative potential is really quite remarkable. If you have an artistic streak, be sure to take some time to experiment with the nifty tools. Here, we've chosen to make this canvas photo monochrome (black and white), but you can choose any colour you like including sepia and full colour options. Welcome to the 21st Century! It’s amazing how much has changed in the world of photography. When once we had film we now have digital. The days of film processing are well and truly behind us. When once we gifted friends and family a photo frame, we can now surprise them with so much more. Now, we can go onto their Facebook or Instagram page, download one of their photos and get it printed to canvas. What a way to surprise a loved one! Better yet, we’re not left with a collection of higgledy-piggledy frames of different shapes, colours and sizes stored in a draw somewhere never to see the light of day. A stunning canvas wall display beats a mess of frames any day. It lets the unique splendour of the images shine through. While frames can be pretty, printing a photo directly to canvas positions the subject front and centre. Also, as soon as we are gifted a beautiful canvas, we can mount it instantly. And it lasts longer. We don’t have to take it off the wall to fix up mounting that has slipped over time. We don’t have to concern ourselves with trying to make a mish mash of chipped, rusted frames look good.